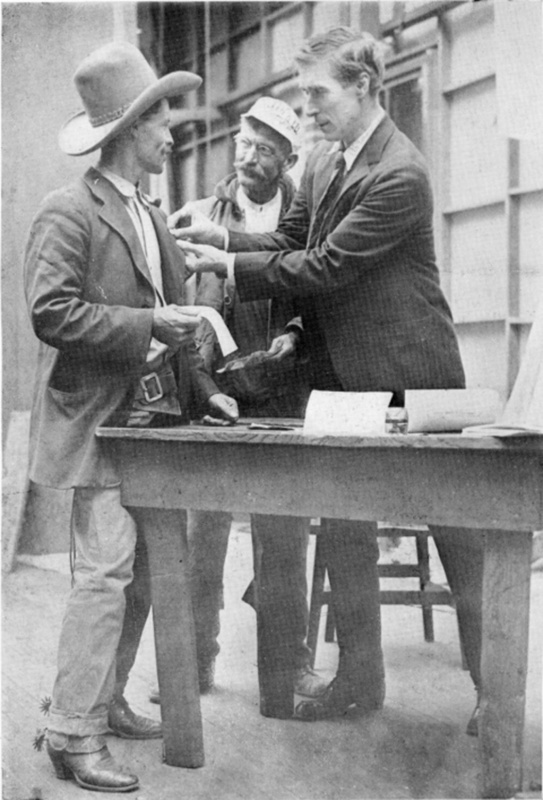 Published photo of actor William S. Hart selling bonds for the 4th Liberty Loan program of World War I in 1918. The first business organization to reach 100% subscription of its employees in the Fourth Liberty Loan Campaign, was the William S. Hart Productions, Inc., of Los Angeles. Before the first hour of the campaign had passed, every employee had purchased at least one bond. Hart, sans his usual makeup, is selling a bond to a movie cow puncher. Original source/publication unknown. Tearsheet from magazine? Heavy, gloss paper; two-sided with Hart photo on one side and Liberty Bond graphic on the other. The fourth (of five) series of Liberty Loan bonds went on sale Sept. 28, 1918. The fourth series involved $7 billion in tax-free bonds that earned the bearer an interest rate of 4.25 percent. Or at least they were supposed to. Holders of Series 4 bonds were in for a bit of bad luck. Series 1-3 bonds were retired in the 1920s but Series 4 had a maturity date of Oct. 15, 1938. The U.S. Treasury called them on April 15, 1934 and refused to honor their terms, which required payment in gold. The private ownership of gold had been banned by act of Congress nearly a year earlier, in June 1933. At the same time, the government had devalued the dollar from where it stood in 1918 — $20.67 per troy ounce of gold — to $35 an ounce. Thus, Series 4 bond holders lost 41 percent of their principal, or $2.866 billion in 1918 dollars. HS9016a: 9600 dpi jpeg from smaller jpeg of printed material purchased March 2003 by Leon Worden.